We had been banging on about it for while but did it live up to the hype? Yes Sir it did! We arrived at the Royal Abert Hall early so we could meet friends and get acquainted with the bar. We were thrilled to bump into our friend Michael Clark from Visionary Trek and his friend Victoria. We don’t want to give spoilers about exactly what they played as the show has just started its tour but here’s an overview of how it went and what you can expect. The live orchestra is positioned under a large screen that plays clips from all movies and series to accompany the music. It was split into segments that is narrated by Michael Dorn. The segments included dedications to different aspects for example; each crew, to the captains, to aliens and the Enterprise. There were also themes such as wisdom, family and allies. The clips they played on the screen weren’t necessarily related to the imagery shown with it. This worked well because we got to see how TOS would look with the new Movies soundtrack and visa versa. There were other segments that were dedicated to individual scenes from a particular episode. In that case they would play just that one clip and music. The attendance of Ron Jones and Jay Chattaway as guest composers was a real treat and the audience loved them. Ron played scores from early TNG but without any video to accompany it. This allowed us to refocus on the music as we kept finding ourselves slipping back to the visual. Which reminds us of our last post where we discussed our expectations. We found it hard to isolate our favourite musical scores from our favourite scenes in Trek, but having attended this concert we have learned that our favourite scenes, have the best musical scores. And that’s not a coincidence. We have learnt that it’s not just good writing and visual effects that make a great scene, but it’s when good writing, acting, effects and music scenes all come together, that’s when the movie magic occurs. The scores chosen for the concert managed a good balance, throwing the audience into laughter and lots of tears! (Holographic tissues please!). Although the clips chosen were very TOS centred with little DS9 and very little Voyager. If Star Trek: The Ultimate Voyage is coming to a town near you we recommend you book fast. With no new television series being aired, this is the perfect way to reconnect with the show and appreciate it in a new light. Altogether it was a great evening. And much like choosing our favourite scenes, we have learnt that it’s not just a good concert that makes a great event. 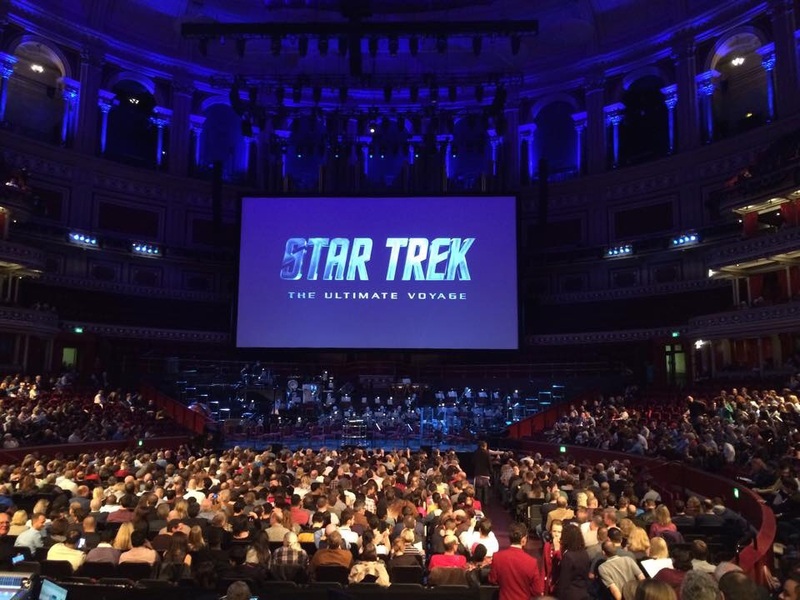 It’s the atmosphere of hundreds of Trekkies enjoying themselves, it’s the incredible location and helpful staff of The Royal Albert Hall and it’s the company, the friends you meet and make on the way. And yeah, the bottles of bubbly helped too! Highlights: ok, can’t resist this spoiler! The mashup of First Contact and Best of Both Worlds. Relieved because: we don’t need to eat our Tricorders as per a bet. We’d like to thank everyone who took the time to come and see us and say hi, it is always great to see our Facebook and Twitter friends at Star Trek events. We are always overwhelmed by your kindness. Especially to Liam who saw that were were in need of TWOK insignia badges and made some for us himself and to Neil who saw we needed personalised Trekkie Girls coasters from all our champagne guzzling and made some for us! You’re all lovely. Big thank you to Rick at The Royal Albert Hall for your support. Live along and Prosper! Previous PostThrough the PeriscopeNext PostLive Chat Tomorrow – New Star Trek Series! !